Israeli Prime Minister Ariel Sharon says he has given his troops a free hand to launch a crackdown on Palestinian militants. His announcement came only seven days after the election of new Palestinian President Mahmoud Abbas. "Despite the change in Palestinian leadership, we have yet to see them taking any action against terror," Mr Sharon told his cabinet. 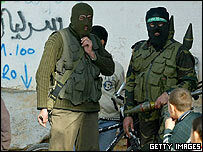 Hours later, the PLO urged militant groups to end attacks on Israel. On Thursday, six Israelis were killed in an attack at a Gaza Strip crossing. Israel severed contacts with the Palestinian leadership after the attack. On Saturday eight Palestinians were killed by Israeli troops during incursions into Gaza. Two Israelis, including a seven-year-old, were injured by Palestinian rockets. "The Israeli military and security apparatus have been instructed to take any action needed without restriction," Mr Sharon said on Sunday. "These instructions will remain valid as long as the Palestinians fail to lift even a single finger." Cabinet members from Mr Sharon's new coalition partners, the Labour party, expressed support for Mr Sharon's tough line. "[Mr Abbas] has clearly said that he is opposed to terrorism but now his words must be translated into action," said Interior Minister Ophir Pines. Will there be more Arafatism without Arafat? "He must prove his determination to confront the terrorists." Palestinian Foreign Minister Nabil Shaath condemned the announcement. "At the same time that Abu Mazen says he will work hard to return to the peace track, Sharon declares a military escalation," he said, using the Palestinian leader's nickname. 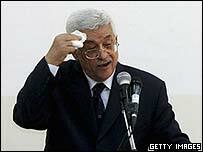 Mr Abbas used his inauguration speech on Saturday to call for a ceasefire between Israel and the militants. Palestinian officials said Mr Abbas will visit the Gaza Strip this week in an effort to convince militant groups to stop attacks against Israeli targets. But the BBC's correspondent in Jerusalem, James Reynolds, says Mr Sharon's latest move may complicate Mr Abbas' tactic of trying to reach a ceasefire through negotiation and persuasion. Militant factions have indicated they will only stop attacks if Israel does the same. Mr Sharon's comments to his cabinet suggest that that is unlikely to happen, our correspondent says.